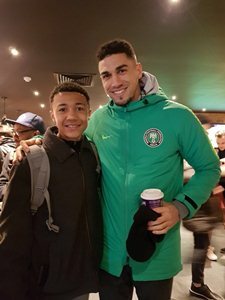 Feyenoord Rotterdam youth-teamer Lateef Omidiji Jnr sparkled in his first training session with Nigeria's U15 national team few hours after his arrival in Abuja from the Netherlands, allnigeriasoccer.com is reporting. The 14-year-old arrived in the country's capital at approximately 2330 hours on Wednesday, May 30 before training with the Nigeria U15s this morning. Few people at the airport took selfies with Omidiji and welcomed him because they immediately recognized him, and right away he felt at home. Lots of people attended this morning's training session, including some Nigerian Federation officials, just to watch the striker and what made the training session so great was it was right after a long flight and he still wowed everyone. The coaches were impressed with how Omidiji's technique was steps ahead of his teammates and when they thought they can get physical, he sent a few of them flying. In his first workout with the national team, he was much faster than those in camp, vocal and looked in full command of the squad, he looked very sure of himself and all could see what the fuss was all about. After training, some of the fans in attendance clapped for him and others got on the field to take selfies with him. The Arsenal linked starlet will have his second workout with the Nigeria U15 team on Thursday evening as from 1700 hours.